The International Space Station, which will be assembled between mid-1998 and 2003, will contain many Russian hardware elements developed in the nearly 30 years of the Russian space station program. The history of Russian space stations is one of gradual development marked by upgrades of existing equipment, reapplication to new goals of hardware designed for other purposes, rapid recovery from failures, and constant experimentation. The earliest Salyut stations were single modules, designed for only temporary operations. Mir, the most recent station, is a permanent facility in orbit since 1986 with a base made up of four separately-launched modules. Additional modules have been added to now total six laboratory modules and one docking module, added to allow the Space Shuttle to more easily dock with the station. U.S. Space Shuttles have been periodically docking with the Mir since July 1995. U.S. astronauts have maintained a permanent presence onboard Mir since March 1996 and that presence is expected to continue through 1998. In 1903, Russian schoolteacher Konstantin Tsiolkovsky wrote Beyond the Planet Earth, a work of fiction based on sound science. In it, he described orbiting space stations where humans would learn to live in space. Tsiolkovsky believed these would lead to self-contained space settlements and expeditions to the Moon, Mars, and the asteroids. Tsiolkovsky wrote about rocketry and space travel until his death in 1935, inspiring generations of Russian space engineers. Soviet engineers began work on large rockets in the 1930s. In May 1955, work began on the Baikonur launch site in central Asia. In August 1957, the world’s first intercontinental ballistic missile lifted off from Baikonur on a test flight, followed by the launch of Sputnik 1, world’s first artificial satellite, on October 4, 1957. On April 12, 1961, Yuri Gagarin lifted off from Baikonur in the Vostok 1 capsule, becoming the first human in space. A year later, Soviet engineers described a space station comprised of modules launched separately and brought together in orbit. A quarter-century later, in 1987, this concept became reality when the Kvant module was added to the Mir core station. First-generation space stations had one docking port and could not be resupplied or refueled. The stations were launched unmanned and later occupied by crews. There were two types: Almaz military stations and Salyut civilian stations. To confuse Western observers the Soviets called both kinds Salyut. The Almaz military station program was the first approved. When proposed in 1964, it had three parts: the Almaz military surveillance space station, Transport Logistics Spacecraft for delivering soldier-cosmonauts and cargo, and Proton rockets for launching both. All of these spacecraft were built, but none was used as originally planned. Soviet engineers completed several Almaz station hulls by 1970. The Soviet leadership ordered Almaz hulls transferred to a crash program to launch a civilian space station. Work on the Transport Logistics Spacecraft was deferred, and the Soyuz spacecraft originally built for the Soviet manned Moon program was reapplied to ferry crews to space stations. Salyut 1, the first space station in history, reached orbit unmanned atop a Proton rocket on April 19, 1971. The early first-generation stations were plagued by failures. The crew of Soyuz 10, the first spacecraft sent to Salyut 1, was unable to enter the station because of a docking mechanism problem. The Soyuz 11 crew lived aboard Salyut 1 for three weeks, but died during return to Earth because the air escaped from their Soyuz spacecraft. Then, three firstgeneration stations failed to reach orbit or broke up in orbit before crews could reach them. The second failed station was Salyut 2, the first Almaz military station to fly. The Soviets recovered rapidly from these failures. Salyut 3, Salyut 4, and Salyut 5 supported a total of five crews. In addition to military surveillance and scientific and industrial experiments, the cosmonauts performed engineering tests to help develop the second-generation space stations. With the second-generation stations, the Soviet space station program evolved from short-duration to long-duration stays. Like the first-generation stations, they were launched unmanned and their crews arrived later in Soyuz spacecraft. Second-generation stations had two docking ports. This permitted refueling and resupply by automated Progress freighters derived from Soyuz. Progress docked automatically at the aft port, and was then opened and unloaded by cosmonauts on the station. Transfer of fuel to the station took place automatically under supervision from the ground. A second docking port also meant long-duration resident crews could receive visitors. Visiting crews often included cosmonaut-researchers from Soviet bloc countries or countries sympathetic to the Soviet Union. Vladimir Remek of Czechoslovakia, the first space traveler not from the U.S. or the Soviet Union, visited Salyut 6 in 1978. Visiting crews relieved the monotony of a long stay in space. They often traded their Soyuz spacecraft for the one already docked at the station because Soyuz had only a limited lifetime in orbit. Lifetime was gradually extended from 60-90 days for the Soyuz Ferry to more than 180 days for the Soyuz-TM. The station received 16 cosmonaut crews, including six long-duration crews. The longest stay time for a Salyut 6 crew was 185 days. The first Salyut 6 long-duration crew stayed in orbit for 96 days, beating the 84-day world record for space endurance established in 1974 by the last Skylab crew. The station hosted cosmonauts from Hungary, Poland, Romania, Cuba, Mongolia, Vietnam, and East Germany. Twelve Progress freighters delivered more than 20 tons of equipment, supplies, and fuel. Salyut 7, a near twin of Salyut 6, was home to 10 cosmonaut crews, including six long-duration crews. The longest stay time was 237 days. Cosmonauts from France and India worked aboard the station, as did the first female space traveler since 1963. Thirteen Progress freighters delivered more than 25 tons of equipment, supplies, and fuel to Salyut 7.
logistics spacecraft redesigned to serve as an experimental space station module. Salyut 7 was abandoned in 1986 and reentered Earth’s atmosphere over Argentina in 1991.
tons, and consists of the Mir core, Kvant, Kvant 2, Kristall, Spektr, Priroda and Docking modules. Mir measures more than 107 feet long with docked Progress-M and Soyuz-TM spacecraft, and is about 90 feet wide across its modules. The Mir core resembles Salyut 7, but has six ports instead of two. Fore and aft ports are used primarily for docking. Four radial ports in a node at the station’s front are for berthing large modules. The core weighed 20.4 tons at launch in 1986. Kvant was added to the Mir core’s aft port in 1987. This small, 11-ton module contains astrophysics instruments and life support and attitude control equipment. Kvant 2, added in 1989, carries an EVA airlock, solar arrays, and life support equipment. 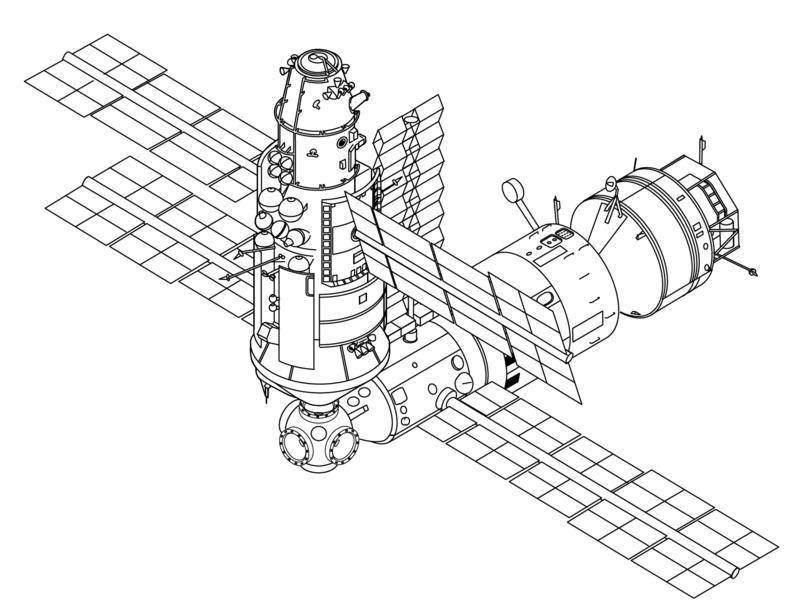 The 19.6-ton module is based on the transport logistics spacecraft originally intended for the Almaz military space station program of the early 1970s. to carry Soviet soldier-cosmonauts to the Almaz military space stations. Spektr was launched on a Russian Proton rocket from the Baikonur launch center in central Asia on May 20, 1995. The module was berthed at the radial port opposite Kvant 2 after Kristall was moved out of the way. Spektr carries four solar arrays and scientific equipment, including more than 1600 pounds of U.S. equipment. The focus of scientific study for this module is Earth observation, specifically natural resources and atmosphere. The equipment onboard is supplied by both Russia and the United States. Priroda was the last science module to be added to the Mir, launched from Baikonur on April 23, 1996, it docked to the space station as scheduled on April 26. Its primary purpose is to add Earth remote sensing capability to Mir. It also contains the hardware and supplies for several joint U.S.-Russian science experiments. The Docking Module was delivered and installed by shuttle mission STS-74 in November 1995, making it possible for the space shuttle to more easily dock with Mir. On STS-71 in June 1995, the shuttle docked with the Kristall module on Mir. However, to make that docking possible, the Kristall configuration had to be changed to give the shuttle enough clearance to dock. Russian cosmonauts performed a spacewalk to move the Kristall module from a radial axis to a longitudinal axis, relative to Mir. After the shuttle departed, Kristall was moved back to its original location. two brief periods (July 1986-February 1987; April-September 1989), Russian cosmonauts have lived aboard Mir continuously for the past 9 years, demonstrating proven experience in space station operations. Dr. Valeri Polyakov arrived on Mir on Soyuz-TM 18 in January 1994 and returned to Earth on Soyuz-TM 20 on March 21, 1995. He lived in orbit for more than 438 days, a new world record. Through 1994, 16 long-duration crews lived and worked on Mir. In all, 19 piloted craft have docked with the station. Cosmonaut-researchers from Afghanistan, Austria, Britain, Bulgaria, the European Space Agency, France, Germany, Japan, Kazakhstan, and Syria have visited Mir. European and French cosmonauts lived on Mir for as long as a month. U.S. astronauts typically spend four months on the station, although U.S. astronaut Shannon Lucid has had the longest tour onboard, six months in 1996. More than 40 Progress and Progress-M freighters have delivered more than 100 tons of supplies and fuel to Mir. The improved Progress-M occasionally carries a capsule for returning to Earth a small quantity of experiment results and industrial products from the station. Occasionally cargo comes back to Earth with cosmonauts in Soyuz-TM capsules. Beginning with STS-71, the shuttle has returned to Earth more industrial products and experiment samples than is possible using the Progress-M capsules or Soyuz-TM. In addition, the shuttle can be used to return components from Mir’s exterior, such as solar arrays, for studying the effects of long exposure to space conditions–a capability not available with Progress-M and Soyuz-TM. Important lessons from Mir operations and Shuttle-Mir operations and research are being incorporated into the International Space Station design and planning. This work is in the public domain because it was created by the United States National Aeronautics and Space Administration (NASA), whose copyright policy states that "NASA material is not protected by copyright unless noted". This page was last edited on 15 May 2018, at 00:04.